← Let down by LPQ! 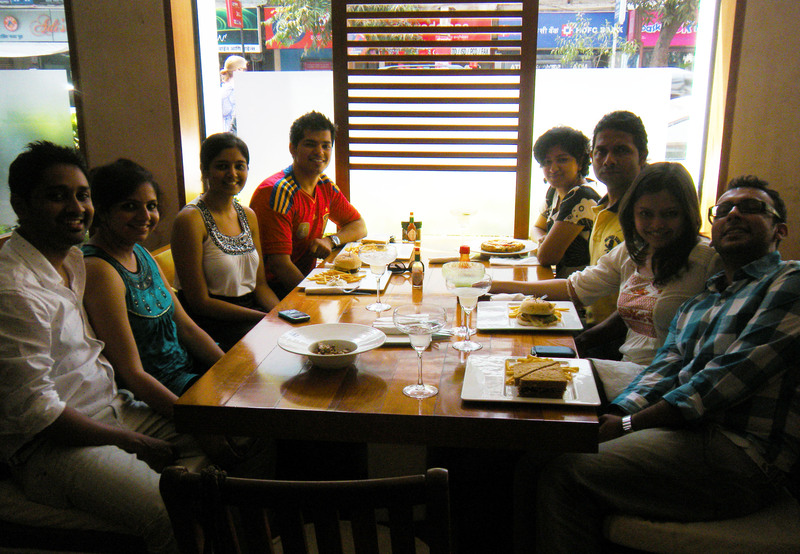 Last month the brigade went to Salt Water Cafe in Bandra for brunch. It was a pleasant summer afternoon and happened to be Easter Sunday. Unfortunately there were no Easter specials. We could not wait to get started and called for a plate of cheese, a plate of deli meats and a basket of bread from their bakery. To quench our thirst we called for pitchers of flavoured sangria. The drinks were refreshing but weak. We then followed up the sangria with some margaritas. The Kiwi margarita was unlike any other margarita I have had but still light on the tequila. We had a couple of newbies join us this time and one of them happened to be a filmmaker. Having learnt that one of the pretty ladies in the group expressed her desire to be an actress and tried auditioning for a non-existent role. The topics of discussion ranged from boredom of work to cyber comic strips such as the sexcapades of Savita Bhabhi’s. This time we spotted model turned actor Milind Soman, who certainly had the attention of the manager and seemed a regular. For our main course we mostly called for sandwiches. I had the roasted lamb sandwich. The quantity and quality of food is good at Salt Water Cafe as I had mentioned in my previous post when I had visited the cafe for dinner. However this time around the service was sluggish and most of us seemed unhappy with our drinks. I religiously go for brunch once a month with the brigade. I am always on a quest looking for the best brunch spot in the city. There are many options for food in Bombay but places serving an all-inclusive brunch are limited. Looking forward to a fierce and fabulous brunch scene in Bombay! Brunch Brigade meets once a month. The purpose of this group is to meet – have fun, find a travel partner, a date (may be), share brain farts and savour brunches. We will be exploring different brunch places all over Bombay. Join our Facebook group for the next brunch date and location information. This entry was posted in Culture, Fashion, Food, Travel and tagged Bombay, Bombay Brunch Brigade, Easter Brunch, Milind Soman, Mumbai, Salt Water Cafe. Bookmark the permalink.